Architecture is not an easy field to study, teach or practice. There are many forms of exclusion that we have to contend with in a highly elitist profession. The exclusion is evident in attempts to “silence” difference; dismiss as “nonprofessional” alternative forms of design, thinking or practice and declaring “other” voices and forms of expression as invalid. This happens in both overt and subtle ways. Sometimes we carry out that censorship ourselves through self-doubt, lack of confidence and years of systematic conditioning. I have generally hated and avoided labels: Woman, Black, Muslim. I usually subscribe to the argument made by the Danish architect Dorte Mandrup: “I am simply asking for the professional courtesy of being considered an architect, without a pre-fixed set of values or attributes. As a creative person working within a creative field, I rely on my ability to take on complex challenges with a full and multifaceted skill set. I do not approach assignments as a woman, but as a professional architect.” (Mandrup, D., 2017). Some disagreed with Mandrup, believing that conditions for women may differ based on context, and that in many countries women would go unnoticed if not for a “strong effort” to recognise them (Howarth, D., 2017). I have personally preferred to engage with the content and meaning of architecture – rather than the symbolic aspect of having more women in the profession or the concerted efforts to expose women’s struggles in the profession. But more and more, I find myself holding positions which may be regarded as contradictory. I am aware of the inequalities in the profession: “The Women in Architecture survey provides disturbing insights into the experiences of 1,152 women worldwide – alarmingly, more than one in five would not recommend a career in architecture.” (Tether, B., 2016: 65). The problems cited in the survey ranged from the lack of authority of female architects in the industry to perceived differences in pay. Many believed that you can only have a good “life/work balance” if you have no dependents – perhaps a reason why many women in the profession do not have children. I appreciate that there is a lack of fair representation in the profession and that we need to focus on achieving change in the discipline through adding diverse voices and views. I celebrate initiatives such as “40 women who shaped cities” which aims to document the role of women “who have left an indelible mark on buildings, culture, and politics in cities across the globe” in an aim to address the “omission and erasure” that often happens (Hester, J. L., 2016). Yet many times, in addition to highlighting the role of women in our male dominated profession, I celebrate voices that question the very profession and its practice. I hope that young architects (men or women) start asking questions about what it means to excel in the field and how we may transform the profession completely. I hope we learn to question particular interpretations of what architecture is – and what a “rise to the top” means within the profession. Women imitating men and following their lead, rather than innovating new ways of “doing”, means no real change will be achieved. I was hugely inspired recently by Zackie Achmat’s Facebook where he listed over 100 women who influenced him (Achmat, Z. 2017). Compiling the list was in itself was an act of love and a wonderful way to honour them. I thought of making my own list of women who inspired me – it would be a long list if it were for my life in general. But it would be a very short list if it were for those I interacted with in the profession. There were not many women in architecture and when we do “make it”, we tend to not be so supportive of our female colleagues. We must also sometimes “fix” ourselves as we demand society be “fixed”. As a woman architect, I have also been mentored and supported throughout my career by many men – and that needs to be acknowledged. It is also important to consider if space and building would be different if we had more active participation for women: “I hate to stereotype,” says architect Fiona Scott. “But I don’t think there are many women who think, ‘Oh, my ideal project would be a massive tower.’” (Rustin, S., 2014). Playing with form and technology at the expense of people and their daily, lived experience is something that our male-dominant profession tends to do. Our most celebrated architects propagated very specific and disadvantaging gender roles through their work and in their personal lives. 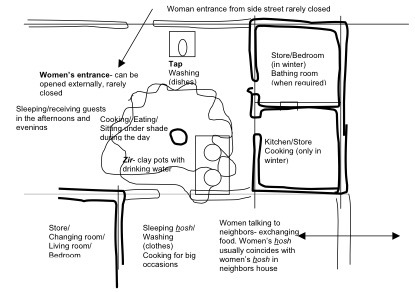 Le Corbusier’s designs reinforced very strong ideas about the role of women in society and in the home – there didn’t seem to be any question about the fact that housework was women’s work (Samuel, F., 2007). These beliefs sometimes played out in how men behaved around women (Zinkin, T, 2014). “Le Corbusier […] is the perfect embodiment of the architect as demiurge who decrees autonomous structures made by men (not women) on a supine earth.” (Betsky, A., 2013) The problems that Le Corbusier’s “Modulor” posed with regards to its lack consideration for gender variations, as well as other variations, is also to be considered. How various standards are imposed on society through built form and space needs to be dealt with in a conscious manner. Having said this, and as with racist attitudes crossing between races, equally, sexist attitudes cross between genders. In other words, a women architect can be as much a culprit, as a male architect, in perpetuating egotistical, elitist and irrelevant modes of practice in the profession. This is a sensitive topic – considering the fact that powerful women have historically been “violently” vilified. Systemic misogyny is real and women tend to be subjected to aggressive forms of slander. But I cannot shy away from the fact that achieving equality means both equal opportunity as well as equal accountability. Women architects should be equally questioned. As women architects, we need to bring more awareness into the profession with regards to gender, space and power. Space can reinforce power relations between people. Space can disempower and disadvantage. As an example, and as a Muslim woman, not having equal access to places of worship reinforces my position as a “second class” Muslim, deprived from equal experience of the main spaces of mosques – and in turn deprived from equal access to the spiritual experiences and knowledge that can be derived from having physical access to those spaces. Being relegated to ancillary spaces, as opposed to main spaces, to side entrances, which are usually dark, unacknowledged, uncelebrated, small and difficult to find – is a powerful reflection of what society thinks of me, my contribution, my role and my rights. Indeed, it could be argued that gender stratification reduces “women’s access to socially valued knowledge.” (Spain, D., 1993: 137). All space and forms are value-laden; they contain meaning; they are not neutral. How spaces and entrances are designed for women say much about power structures in society. There is much research to be done in terms of gender dimensions in architecture. In my PhD I write about women, dress forms and space use in northern riverain Sudan, how a woman’s space “expands” depending on her dress form and how she takes over men’s space in the home at certain times of the day. I also write about makeshift kitchens and nomadic patterns in the home and how these patterns are translated into contemporary urban homes (Osman, 2004). This is not unique to the Sudan: “Gender relations are thus implicated in the conventional social and hierarchical arrangement of cities, where it is sanctioned that man should dominate space and that the house is woman’s assigned place.” (Lico, G. R., 2001: 37). Having more women in the profession would ensure better documentation and representation of these experiences, create awareness to start dismantling disadvantaging spatial norms as well as enable space articulation to be better suited to women’s needs, better serving women and society in general in private and public spaces. The entrants are also asked about their experience of the construction industry and the challenges it posed and the support they received. They are asked about “work life balance” and in what way they are role models to their families and communities. It quickly became apparent that women architects are judged on much more than what men architects are judged on! A male architect is never asked if they have achieve a work life balance and if they are good role models for their families. Indeed, they may fail completely in that regard but they are still considered to be successful architects. The architectural work outputs were restricted to one A3 sheet and were obviously not the focus of the awards. Once we understood that, we set up weighted criteria to be able to accurately compare the submissions. We aimed to assess the contributions by the entrants in terms of publications, examination duties, competitions and juries. The architectural project contributions were assessed in terms contributions to city, public space, environment, sustainability and community based projects. We also assessed the role of the women architects in contributing to their professional communities through in-service training or mentorship programmes and/or internships. We also tried to assess to what extent the entrants participated in the professions voluntary associations and in what ways they addressed issues of corporate social responsibility or investment. With regards to the difficulties faced in the profession, we defined that as “business acumen” in practice. (I acknowledge the role of the jury members in this process). While the launch of this award gives good reason for celebration, it is also an opportunity to reflect on how we would like to see it evolve in the future. This conversation will also help us better articulate our positions about gender representation in the profession. I would like to see women architects being celebrated for excellence in their professional contributions. I would also like to see them not being held up to impossible standards in terms of how we believe women architects should be as role models and as having succeeded to achieve work-life balance. It will also be interesting to interrogate their built work to see if they have succeeded to design differently with a heightened sensitivity to gender issues with regards to space and built form. I hope this award does not lead to naïve interpretations of what an increased role for women in our profession could mean. I hope we are able to avoid superficial analysis and to rather bring a depth to the debate about how a transformed profession could benefit all sectors of society. Ideally, we would all be assessed by one set of criteria, and ideally we would reach a stage when we didn’t need to single out a particular group of people (based on race or gender) to confer awards. However, we know that many important contributions go unrecognised in mainstream practice. Ideally, we would all be labeled “architects” in a transformed profession that serves all and celebrates contributions to humanity beyond the narrow confines of conventional practice. Achmat, Z. 2017, Facebook post, Available at https://web.facebook.com/zackie.achmat/posts/10154802228832267 [Accessed 11 August 2017]. Betsky, A., 2013, Le Corbusier and the Sexism of Architecture, Let’s face up to the sexism in the work of Le Corbusier and the other modern masters, Architect, The Journal of the American Institute of Architects, Available at http://www.architectmagazine.com/design/le-corbusier-and-the-sexism-of-architecture_o [Accessed 11 August 2017]. Hester, J. L., 2016, 40 Women Who Shaped Cities, CityLab, Available at https://www.citylab.com/life/2016/11/rad-women-worldwide-shape-cities/505949/ [Accessed 11 August 2017]. Howarth, D., 2017, American women in architecture weigh in on “female architect” debate, Dezeen, Available at https://www.dezeen.com/2017/07/13/american-women-architecture-reactions-dorte-mandrup-opinion-female-architect/ [Accessed 11 August 2017]. The Politics of Gendered Space, Humanities Diliman, Vol 2, No 1, 30-44. Mandrup, D., 2017, “I am not a female architect. I am an architect.” Dezeen, Available at https://www.dezeen.com/2017/05/25/dorte-mandrup-opinion-column-gender-women-architecture-female-architect/ [Accessed 11 August 2017]. Osman, A. 2004, Space, place and meaning in northern riverain Sudan. Unpublished PhD thesis. University of Pretoria. Rustin, S., 2014, If women built cities, what would our urban landscape look like?, The Guardian, Available at https://www.theguardian.com/cities/2014/dec/05/if-women-built-cities-what-would-our-urban-landscape-look-like [Accessed 11 August 2017]. Samuel, F., 2007, Le Corbusier in Detail, Elsevier: Oxford. Spain, D., 1993, Gendered Spaces and Women’s Status, Sociological Theory, Vol. 11, No. 2 (July 1993), 137-151, American Sociological Association. Tether, B., 2016, Results of the 2016 Women in Architecture Survey revealed, The Architectural Review, 65-71, Available at https://www.architectural-review.com/rethink/results-of-the-2016-women-in-architecture-survey-revealed/10003314.article [Accessed 11 August 2017]. Zinkin, T, 2014, From the archive, 11 September 1965: An awkward interview with Le Corbusier, The Guardian Archive, Available at https://www.theguardian.com/artanddesign/2014/sep/11/le-corbusier-india-architecture-1965 [Accessed 11 August 2017].